I usually pay no attention to the fabric on chairs I buy because I know I can change that out easily. Oh I’m not that handy, but I know people who are. If you don’t like doing upholstery yourself, I highly recommend that you ask around to find a good place that is not too expensive near you. Prices vary greatly from one place to another. So back to my question, when should you reupholster a chair. 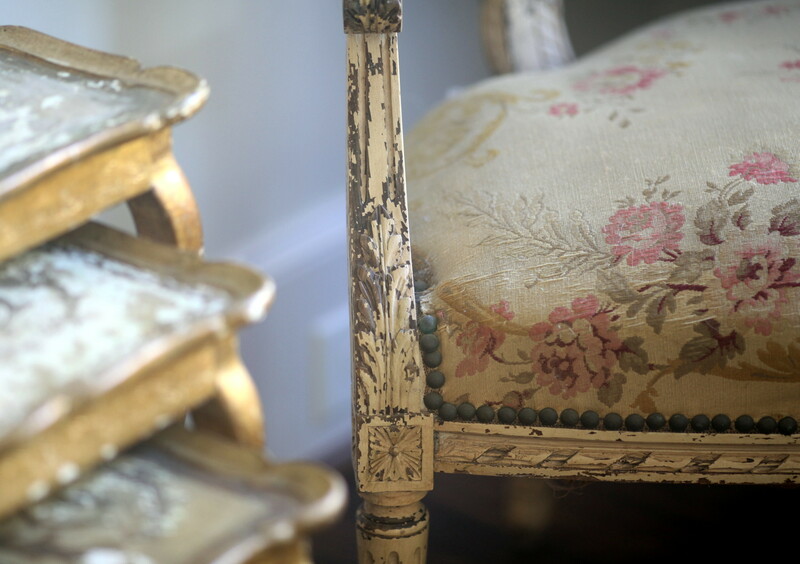 I talked in this post about when reupholstry worth the cost, CLICK HERE. But another question is when should you leave a chair alone? I think if the chair is worth a lot as is, yeah leaving it alone seems smart. But usually the chair with old upholstery on it is not worth that much. Ultimately it is your house and it needs to make you happy. If you can’t decide that I recommend waiting until you are sure. I’ve had this settee for at least 4 years, and just now had it redone. Sometimes you need to replace the fabric because it is falling apart or worse because the stuffing is full of bugs. 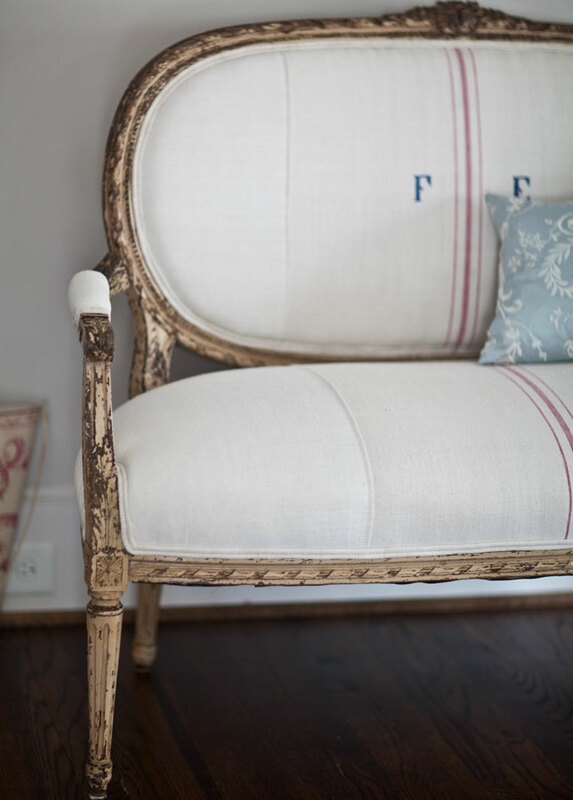 My personal opinion is that if you adore the chair but not the fabric go ahead and replace the fabric. Try to go with something classic so you’ll still love the chair 5 years from now. If the chair is nothing special it is not worth the expensive and effort to redo it. One way to keep the costs down is to not use nail head trim. It seems all of my chairs came with nail head trim. That costs more that using fabric welting, so I always ask that they use a double welt instead. 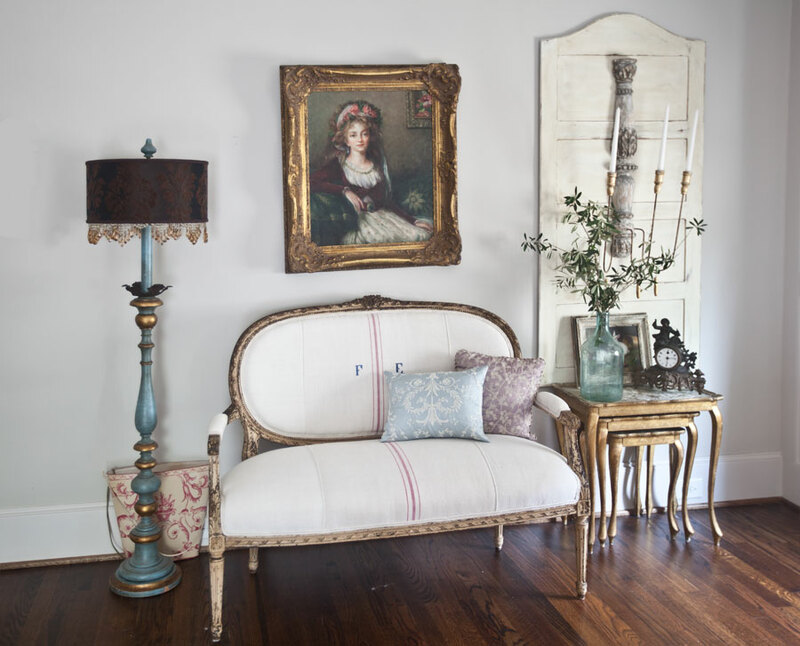 I love this settee, but the strapping underneath the piece was coming apart. My daughter kept sitting on it even though it was kinda falling apart so I knew I had to get it fixed. And I planned to keep the fabric that was on the settee, but began to wonder about it. You see I had these chairs. At some point I decided to redo them. I didn’t think they were that old, but they were. They were stuffed with horse hair. The store told me what they found inside the chairs and it was a little gross. (bugs) Suffice it to say, the stuffing and the fabric was discarded, and they completely rebuilt them from the frame up. 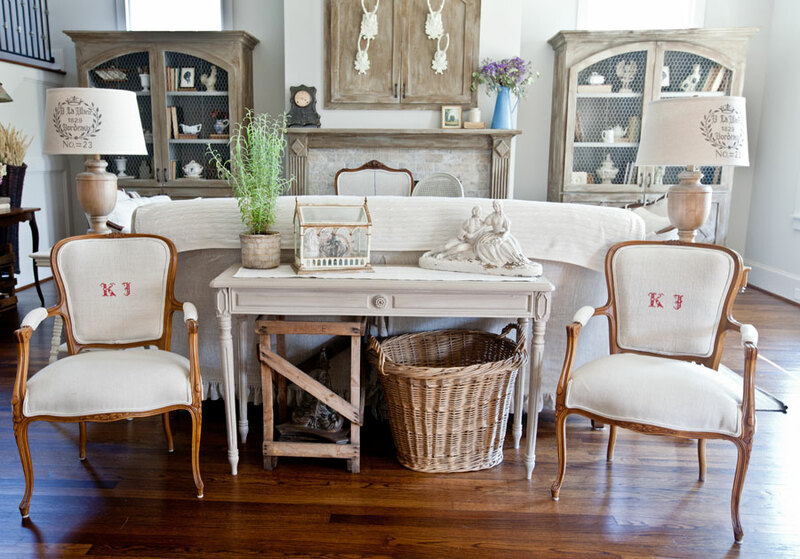 The French chairs are definitely more clean and modern looking now, but still with a nod to the past considering we used antique grain sacks for the backs. Back to my settee. I love the chipped paint, but the fabric was worn in many places. And I was a bit concerned about what was under the fabric. So I made the difficult decision to recover the settee. I also wanted to give it a fresh clean look. 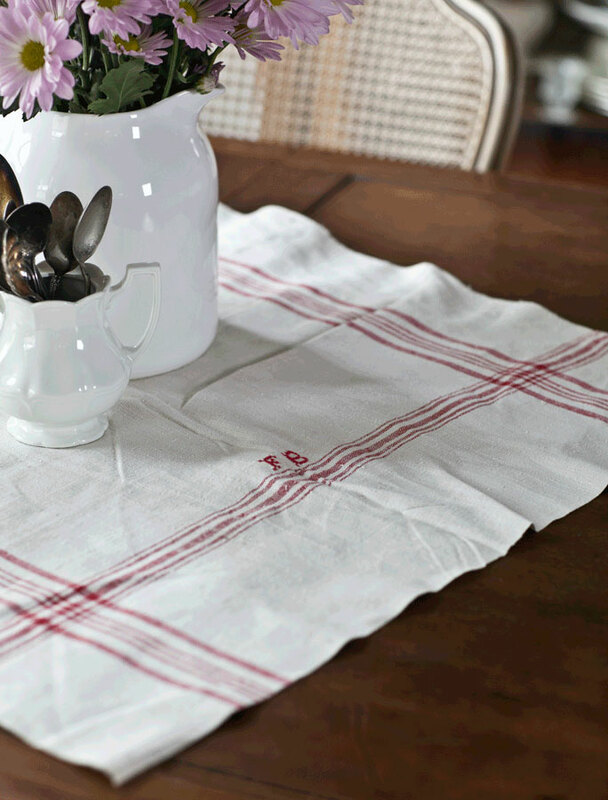 The center section is grainsack and the other part of the fabric is antique linen bed sheets. 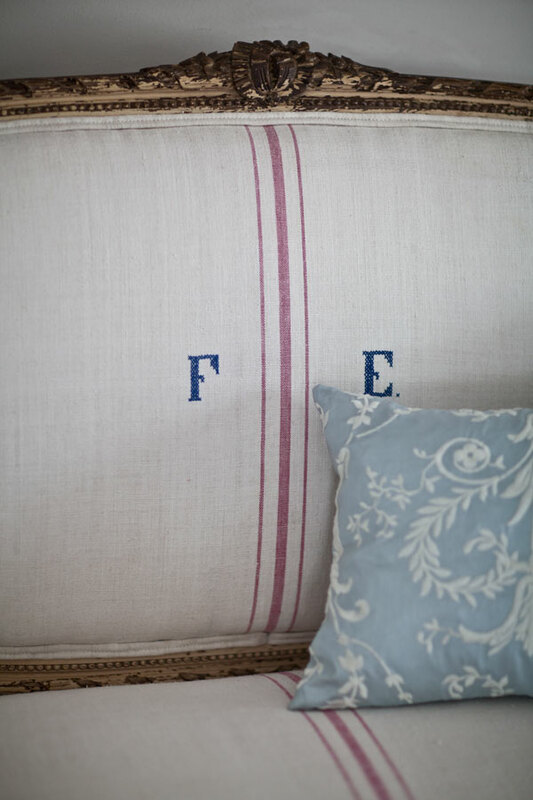 I just love the red stripe and the monogram in the center. My plan was to just use a cream linen on the settee, but look how much interest this stripe adds. I love how the settee looks in my bedroom. You can see the full bedroom HERE. 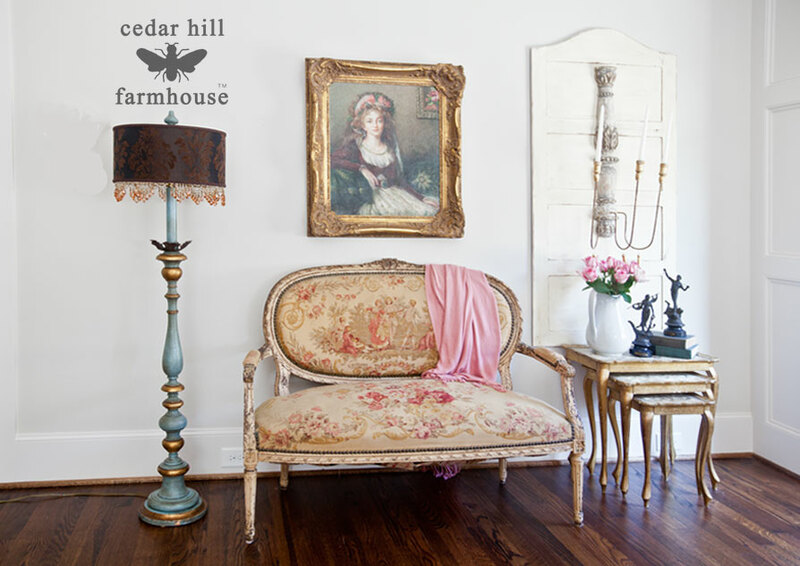 I love both the before and afters of the chair and settee. I would hate to recover such pretty old fabrics, but agreed, if totally tattered and worn, or full of bugs, you have to recover it! I’m getting ready to do that myself with some French chairs. It kills me because it’s a beautiful quilted toile, but I’m going to see if some can be salvaged for throw pillows! 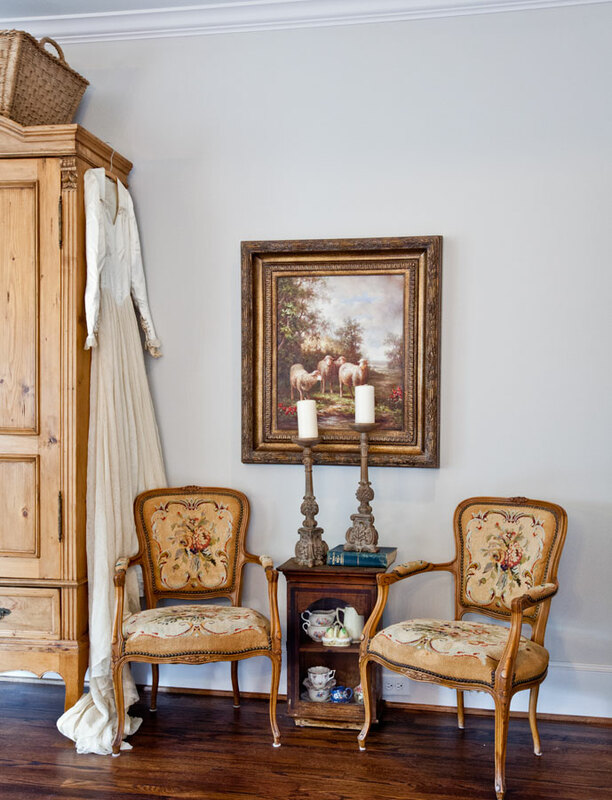 I use a lot of vintage grain sack fabric I buy in Round Top. If you need some let me know, I have a few extras. Otherwise I order linen online like at nyfashionfabrics. Please tell me where do I find a big white ewer to put flowers in? It’s an antique Irene. I got it at Round Top. My wife has a really nice old chair, and we were wondering if we should get it reupholstered. It’s interesting that you don’t actually need to get it redone. We will definitely have to take a look at it again. 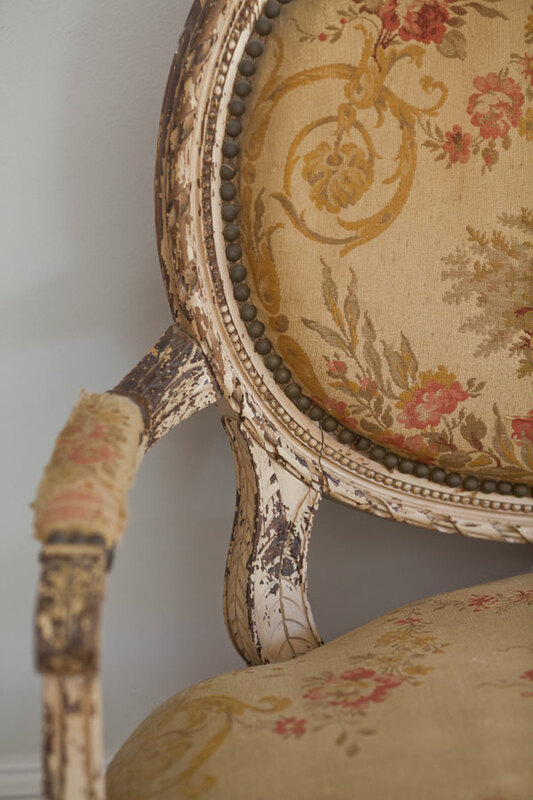 I have a beautiful and comfortable bergere chair I bought a decade ago. I paid about $1200 for it so I feel it is worth reupholstering. My problem is we moved to SC and really don’t know anyone to ask for referrals to a good shop. My question is how do you determine if a shop is good or what questions should you ask before you select one? Molly, sounds like a fabulous chair. Well I am not sure how computer savvy you are. I used the app Nextdoor for referrals on everything. Otherwise, maybe a local funriture store or fabric store would know a good upholstery shop. Or find a shop and ask for references. Hopefully you will find one soon. My husband and I have some old chairs that we got from our grandma, and we have been wondering if we should reupholster them. I like how you mentioned that if the chair is nothing special then it won’t be worth it to redo it. My husband and I will have to make sure we really do love the chairs if we reupholster them.